When it comes to the design of spaces you use most in your home, a little luxury can go a long way. Master bathrooms can be one of the most important rooms to invest in at home. After all, this is typically the room in which you perform your morning and evening personal hygiene routines, so you want to make sure the ambience in the master suite can help you get your day off to a good start and end your day on a good note. Some features of a outstanding master bath experience if you are part of a couple include unique shower fixtures, functional his-her bathroom vanities high-quality countertops and storage spaces. The perfect master bath is nothing without a luxurious walk-in shower. Going beyond the simplicity of a normal tub-shower combo isn’t hard to accomplish; however, a little extra investment in this area can yield great rewards in everyday comfort and the wow factor. One feature you may want to consider in your shower is the dual showerhead. Whether increasing the pleasure of your morning bathing experience or rekindling your romance in the evening, double showerheads are one of those bath design features that you won’t regret. One challenge to designing your new master suite is organizing the space you have according to your needs. While double-sink vanities have become a norm in larger homes, if personal space is a necessity for a couple, you may want to consider his-her bathroom vanities. Not only are separate vanities a stylish and elegant way of designing the flow of your master bath, they can also minimize any arguments a couple may be heading for when his and her hygiene products are separated. Having been married for many years, the beauty products, lotions, potions and hair accessories can mount up over the years. We could have avoided some arguments if only we had individual vanities those years ago. Another aspect to consider is the maintenance required by various countertop materials. While cultured marble and granite have been traditionally heralded as the go-to bathroom countertop materials, the nearly maintenance-free beauty of quartz is an undeniable attraction in master baths. Various engineered stones and Quartz are very attractive, often less expensive and are easier to maintain than marble. Most kitchen and bath showrooms in NJ today offer a wide selection of countertop samples for you to check out. You will be blown away by the variety. 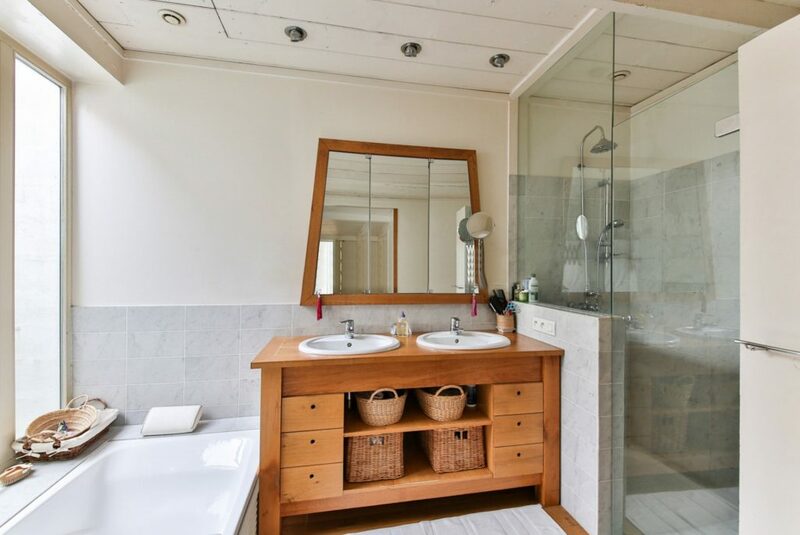 Building master bathrooms for couples can add great value to your home and your life. Whether it’s the extra counterspace his-her bathroom vanities provide, the luxury of dual showerheads, or the appeal of durable quartz countertops, these are just a few of the bath design remodeling ideas that can help to create the perfect atmosphere in your home.